Saad Bguir was the unlikely two-goal star as Esperance of Tunisia defeated Egyptian side Al Ahly 3-0 to win a third CAF Champions League title. The 24-year-old midfielder, a reserve for most of the campaign, only started in the second leg of the final because of Franck Kom's suspension. 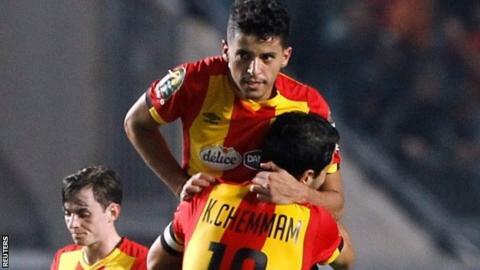 Anice Badri completed the scoring to give Esperance a 4-3 aggregate victory. They had lost the first leg 3-1, with Ahly converting two controversial penalties. A dominant performance by the 'Blood and Gold' at the Stade Olympique de Rades ended a 10-match winless run against Ahly in CAF competitions that stretched back to July 2011. Al Ahly's first-leg victory included two penalties that were confirmed with the use of Video Assistant Referee technology. The Esperance fans were not only angry at both penalties but also with Ahly's Moroccan striker Walid Azaro, who was caught ripping his own shirt by TV cameras. That incident led to Azaro being banned for both the second leg in Tunis and a further continental match in the future. Esperance, champions in 1994 and 2011, will now take part in December's Club World Cup in the United Arab Emirates.